Our Days Inn & Suites Mineral Wells hotel provides friendly service and easy access to area attractions, including nearby Possum Kingdom Lake and Lake Mineral Wells State Park. 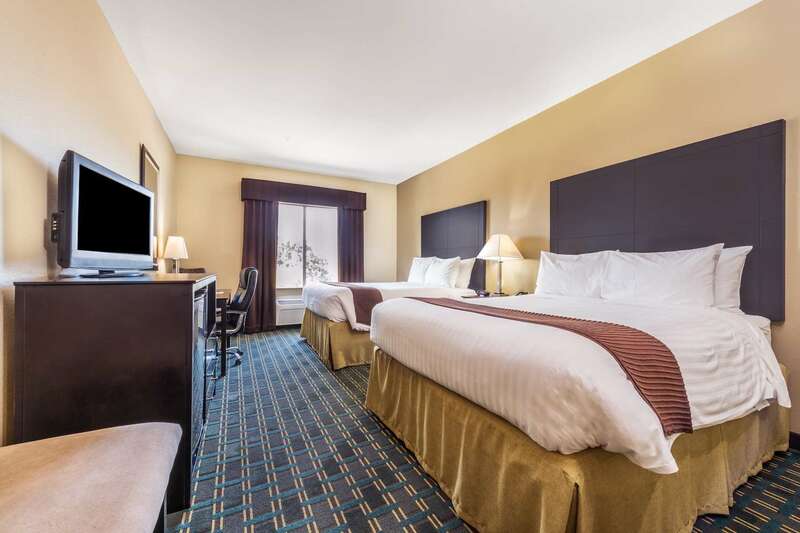 Our rooms are relaxation-ready with pillow-top mattresses, flat-panel TVs, microwaves, and refrigerators. Begin days with a free, hot Daybreak continental breakfast and a workout in our 24-hour fitness center while you enjoy our free WiFi. Wrap up your work at our business center or swim in our seasonal outdoor pool. Enjoy our BBQ grills and guest laundry service. Known as the Great Lake of Texas, nearby Possum Kingdom Lake offers boating, canoeing, fishing, hiking, and biking trails. Cliffs Golf Course, one of the toughest courses in Texas, affords spectacular lake views. Get lost in the beauty at Clark Gardens Botanical Park, or pack a picnic and head to Lake Mineral Wells State Park, just a short drive from our hotel. At Mineral Wells Fossil Park, hunt for fossils dating back to 300 million years.